There are many things I am not afraid of. I’m not afraid of heights or spiders or snakes or flying or roller coasters or open water. I’m not afraid of taking tests or dogs or the dark or needles or thunderstorms. But that doesn’t mean I’m not afraid of anything. 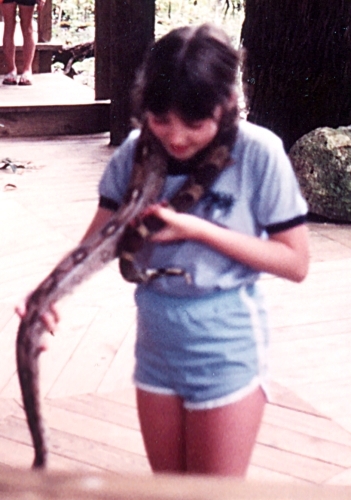 This is me, age 11, at Silver Springs in Florida, holding a boa constrictor. I volunteered to do this. When they asked who wanted to hold the snake, I stuck up my hand and waved it, and I may even have stood up, because I was small and used to going unnoticed. I didn’t expect to be picked, but I was, likely because I was the only girl expressing an interest. That’s ok. As I say whenever someone wins a contest because they were the only one who entered: you beat everyone who didn’t even try. For me, holding the snake was not scary. The scary thing was asking to hold the snake, sticking up my hand, drawing the audience’s attention to me, taking the risk that I’d try and fail. That I wouldn’t get picked. That I’d not only be disappointed that I didn’t get to hold the snake but embarrassed that everyone (read: a bunch of random people on spring break) knew I’d waved my hand like a lunatic because I wanted so badly to be chosen. If it had been something else, something I wanted less, I would’ve left my hands by my side, let the opportunity slide by. There have been plenty of these moments in my life, most of which I don’t even remember clearly now. But I remember that time I held the snake. At that moment, my desire overwhelmed my fear and I acted. A century ago, Katherine Mansfield wrote, “Risk! Risk anything! Care no more for the opinions of others, for those voices. Do the hardest thing on earth for you. Act for yourself.” This is one of my favorite quotations, one I keep returning to, because for me, this—silencing the voices, acting for myself—is the hardest thing on earth, and I need to keep reminding myself to take the risk. Any endeavor has attendant risks, but because they are so often seen as frivolous, creative endeavors often carry a greater risk to one’s face. If you’re a mediocre doctor, you’re still a doctor. If you’re a mediocre artist, you’re wasting your life. There’s a lot of pressure to be good right away so you can silence the doubters, when we all know “that before you can be good at something, you’ll almost certainly be bad to mediocre at it.” Looking like something is effortless takes practice. And while becoming good at something mostly takes hard work, becoming great takes more than just doing the same thing over and over. You have to be willing to take risks, fail, and try again. We’re all familiar with the writer who writes an amazing first book—and then follows it up with 27 competent clones. That writer is good, but they’re not great. The great writer writes a second book that’s so different from the first that the publisher doesn’t know what to do with it and they end up parting ways. The risk, of course, is that book two might be a disaster. But, then again, it just might be brilliant. Of all the creative arts, writing is perhaps the riskiest, because it’s so transparent. You can expose your deepest secrets in music, painting, dance and still leave the audience and critics divided as to what that was really about—even as they are moved to tears. With writing, it’s harder to obscure your source material. To be sure, you can cloak your story in metaphor or fictionalize it, but if you’re writing an essay about your mother, you’re writing an essay about your mother. Sometimes transparency is the point. Things I do fear: small talk, schmoozing, job interviews, cold calls, having to answer questions on the spot, asking for favors, and failure, especially at writing. Writing is a minefield of fears. Fear that we have nothing worthwhile to say. Fear that what we have to say is a cliché. Fear of taking our writing seriously. Fear of not being good enough. Fear of embarrassing ourselves. Fear of how much work it’s going to take. Fear of not-writing. Fear that we will offend the people we care about. Fear that we will offend, period. Fear of rejection. Fear of repercussions. Fear that the wrath of the internet will rain down upon us. Fear that books are dead. For some of us, the fear started the moment we picked up a pencil. In elementary school, my handwriting always earned a “Needs Improvement” on my report cards. At one point, I was slotted into the remedial handwriting group, a bunch of oafish boys and me, bookish nerdgirl. I became so self-conscious about my handwriting that I allowed it to hamper my writing. Someone would give me a beautiful blank notebook or a cute little diary and I’d be unwilling to write in it because I was only going to ruin it. When I finally gave it a try—because I felt guilty for not using the gift—it would be just as ugly as I’d anticipated and I’d quit because the book was ruined. Or I’d tear out the pages so that I could start fresh. I spent more time rewriting things to try to make them look better than writing anything new. I finally ended this cycle by starting to write in a regular school notebook with a pencil. My handwriting didn’t matter so much because the notebook wasn’t pretty or precious; it was ugly and utilitarian. The pencil allowed me to erase my mistakes. Somewhere along the way I started writing in pen. Eventually I reached the end of the notebook and I started a new one. At the same time, I started filling a hardback notebook (that, yes, the initial pages had been torn from) with lists, quotes, magazine clippings, poems I wrote. Though I didn’t know it at the time, this was my first commonplace book. I still fretted too much about perfection, but I’d found a way to move forward: one scary thing at a time. If you’re thinking my handwriting story sounds silly, that’s exactly my point. If you want to write, write. If you want to write about your childhood, write about your childhood. If you want to write a book, write a book. Most of the obstacles in our writing paths are trivial, or at least, surmountable. We envision them as Mt. Everests, when they’re more like that hill in your neighborhood that you walk up every day. I frequently hear people say, “I can’t,” when what they really mean is “I don’t want to” or “something else is more important to me” or “I don’t want my image to be that of a person who does that” or “I’m afraid to try because I might fail.” “Can’t” absolves us of responsibility. It’s not that we’re unwilling to take a risk or put the effort in, it’s that we can’t. Fate has decided this for us. It’s not our fault. It’s not a choice. Except it is. “Can’t” is almost always a choice, the safe choice. If you don’t try, then you can’t fail. We live in a culture obsessed with safety. We like to think it is possible to eliminate risk. When something bad happens, the first thing we do look around to see to whom we can assign blame. When we find a scapegoat, we exhale with relief. It would never have happened to us because we would never have taken that sort of risk! This kind of thinking permeates all aspects of our lives. You’ve surely read many cautionary tales about the awful consequences that may befall you if you write about your job, your children, your personal life, you name it. But while safety-first thinking is prudent when you’re talking about an activity with real physical risk—skydiving, say—it’s less useful when you’re deciding how you want to spend your life. Always choosing the safest choice may make for a comfortable life, but it probably won’t be a very interesting or satisfying one. For that, you have to be willing to take a risk. One of the things I most looked forward to as a biology undergrad was taking herpetology. To my great disappointment, the class was always “not offered” or canceled. I guess there weren’t enough students interested in snakes. At the time, I just swallowed my disappointment and grumped about the poor course selection. Now I know this wasn’t my only choice. The brave, scary, potentially rewarding choice would have been to go directly to the herpetologist and ask to do a directed study. This would’ve meant taking the risk that he’d say no. But maybe he’d have said yes, and now I’d be traveling the world, writing about reptiles and amphibians for National Geographic. I can’t exactly berate myself for not doing this, because I don’t think it even occurred to me. For a long, long time, I held the belief that “no” meant “no” and the polite, grown-up, civilized thing to do was to accept a “no” without protestation and move on. One of the important lessons I’ve learned in the past few years is not to just walk away when you hear “no.” No one is going to think less of you for trying again (and again and again). And if you really want something, it’s worth it to ask: “How can I change this ‘no’ to a ‘yes’?” “No” can be a kind of filter. It’s used to weed people out. My eyes were opened when I heard a guy tell the story of how he got accepted to law school. Turns out, he wasn’t, but instead of saying, “oh well,” he basically marched into the admissions office, told them he’d already quit his job and yadayadayada his life was riding on this and they pulled his file and reclassified it as a mature student application and the rest was history. It was scary, but you know what? I succeeded. Ray Bradbury once said, “I worry about rejection, but not too much. The real fear isn’t rejection, but that there won’t be enough time in your life to write all the stories you have in you. So every time I put a new one in the mail, I know I’ve beaten death again.” In the wake of her father-in-law’s death, Maud Newton wrote, “And it’s impossible to imagine ever returning to a life in which I treat my writing like a frivolous hobby or prioritize writing about other people’s novels over working on my own.” He had been working on a book. It was left unfinished. This entry was posted in AB 2012, Absolute Blank and tagged Articles, Beaver, Excuses, Risks, Theryn Fleming, Writing Fears by TC Editors. Bookmark the permalink.